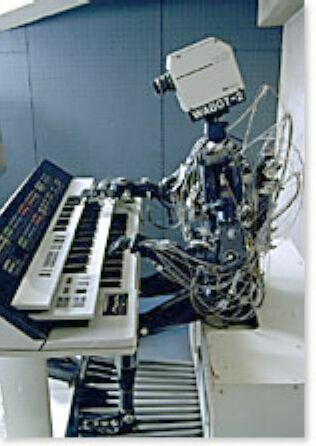 So, I spotted this image on the mighty LOLBOTS, and thought - holy crap, it's Johnny Five playing a Yamaha GX-1. But it isn't. 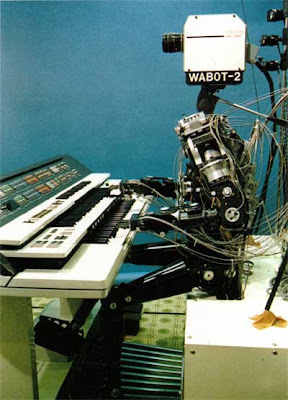 It's WABOT-2, a Japanese robot from 1985. It weighed 90kg, and was connected, via 13 fibreoptic cables, to a computer room 20 metres away. It could read a score, take requests from the audience and play along with a singer, listening to their voice and playing in tune. There's a good introduction here, and pictures here, here and here. The organ itself isn't a GX-1, but a rather less hip FX-1, which used FM synthesis rather than miles and miles of wire and analog circuits - which Matrix has written about at length - lots of nice pictures here.